What could be more MEGA than starting off with, in my words, the classic Mega Shark vs Giant Octopus for our MEGA Season? Two behemoths of the prehistoric world, stepping toe to toe against each other off the coasts of Tokyo and San Francisco, battling it out for supremacy of the seas. Who will win, who will loose and can man survive their oarsome power? While ‘borrowing’ a research submarine to track a pod of whales, marine biologist Emma MacNeil (Deborah Gibson – Mega Python vs. Gatoroid and Ghost Busters) is caught up in a military accident in the north of the pacific. During the accident part of a glacial shelf is broken loose, setting free these two gigantic beasts which have been frozen in ice for millions of years. Though unaware of what has happened Emma, thinks she so something in the darkness during the accident. With the beasts now loose, strange and deadly events start to happen along the American and Japanese coastlines. With Emma now fired from here job after ‘borrowing’ the sub, she must teams up with her old professor and former U.S. Navy pilot Lamar Sanders (Sean Lawlor – 30,000 Leagues Under the Sea and The Black Waters of Echo’s Pond) to work out what is going on, along with fellow scientist Seiji Shimada (Vic Chao – Mad Cowgirl and 24). Soon the three of them are forced into working with the government, led by Allan Baxter (Lorenzo Lamas – Falcon Crest, The Bold and the Beautiful and 30,000 Leagues Under the Sea) a government official and somewhat slim-ball. With attacks increasing and the death toll rising can they find a way to stop Mega Shark vs Giant Octopus? 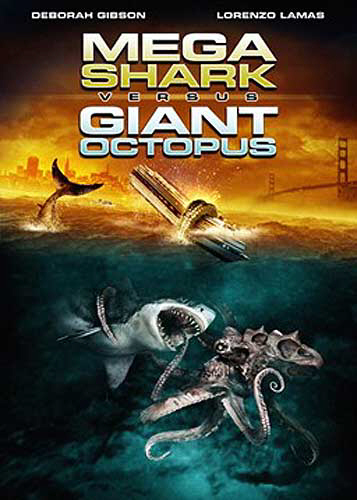 So what can be said about Mega Shark vs Giant Octopus that hasn’t already been said before, though met by the majority of the movie press with negativity and mocked across many of the television news broadcasters on release, Mega Shark vs Giant Octopus has become a huge cult classic in my eyes and should be looked upon with more revered eyes. No, it doesn’t have the budget and production values of the mainstream Hollywood offerings, but is has something much more than many of those films have, heart and a sense of unbridled enjoyment in its own subject matter. Yes the effects are cheap and somewhat miss the mark on a number of occasions, but some have also become classics. For example the flying shark vs a jumbo jet is now in the annuls of movie history as one of the most jaw-drop movie experiences ever, no matter what you take is on it, good or bad. Also the actual smack down between the two protagonists, when seen, is handled fairly well by the effects budget, though repeat shorts are used often and are some what dark. The film is not just about two big beasts squaring up against each other, there are also the human actors within the film that need a mention. Though the script has enough ham to affect the stock market prices of pig values, all the actors embrace their roles with energetic glee and enjoyment. Though I was worried when I heard the name Debby Gibson, but she too surprised me and I though she acted well with what she was given to work with. I just cant wait till she faces off against her 80s teen rival Tiffany in Mega Python vs. Gatoroid. As I mentioned earlier, the film does have its critics, but why would those people be watching a filmed titles Mega Shark vs Giant Octopus if the first place, the title tells you all you need to know about the film. But I’ll leave you with these words from Phelim O’Neill from The Guardian Newspaper, “just having this in your house will provide more of a talking point than your box sets of Kurosawa, Kubrick, the Coens and other directors too cowardly to have even a glimpse of an oversized fin or colossal tentacle in their oeuvre.” I think that says it all about this film, check it out if you haven’t already and if you have watch it again, you know you want to. In the scene where Emma, Seiji and Lamar are interrogated, Baxter (Lorenzo Lamas) describes Emma as “a woman whose career is all washed-up.” This is a pun on Deborah Gibson‘s music career, which reached its peak with the album Electric Youth in 1989, but floundered through the 1990s.